Dechapol Puavaranukroh (left) and Sapsiree Taerattanachai. 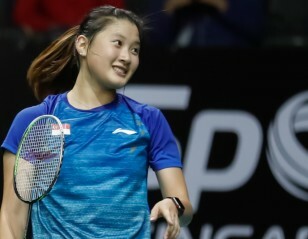 Dechapol Puavaranukroh and Sapsiree Taerattanachai served up a massive upset today at the Singapore Open 2019, as they brought to an end Zheng Siwei and Huang Yaqiong’s 18-match unbeaten streak this year. 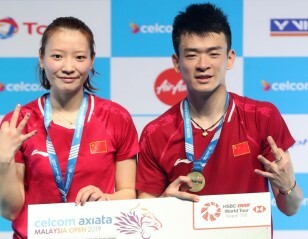 The top-seeded Chinese had swept everything before them in the run-up to this tournament, winning 15 matches in a row and picking up three titles. Puavaranukroh and Taerattanachai went in having lost all six previous encounters against the world champions, but the underdogs stepped it up today with brilliant badminton under pressure. The pivotal moments were in the closing stages of the opening game; the Thais withstood a torrid attacking spell before turning the tables on their opponents. The Chinese recovered well to take a 14-9 lead in the second, but couldn’t raise their level even as their opponents clawed their way back. Puavarnukroh and Taerattananchai, who are in their third final this season, will be eyeing their first title in over a year. “Today we were able to control it well, we kept the shuttle down and that enabled us to attack. In the first game we were too serious, but after the break we changed our approach and tried to have fun. We are of course happy to be the first pair to beat them this year,” said Taerattanachai. 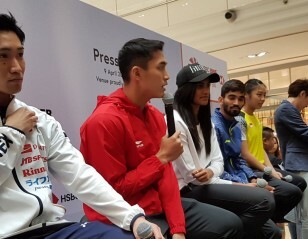 Malaysia’s Tan Kian Meng (left) and Lai Pei Jing. There were a couple of memorable comebacks in the session. 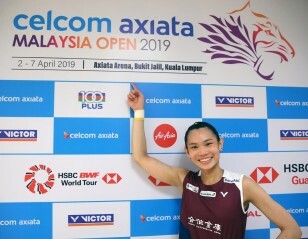 Tai Tzu Ying reached her third straight final after saving five match points against Akane Yamaguchi, while Tan Kian Meng/Lai Pei Jing made their first final in a year after saving two match points against Hafiz Faizal/Gloria Emanuelle Widjaja. 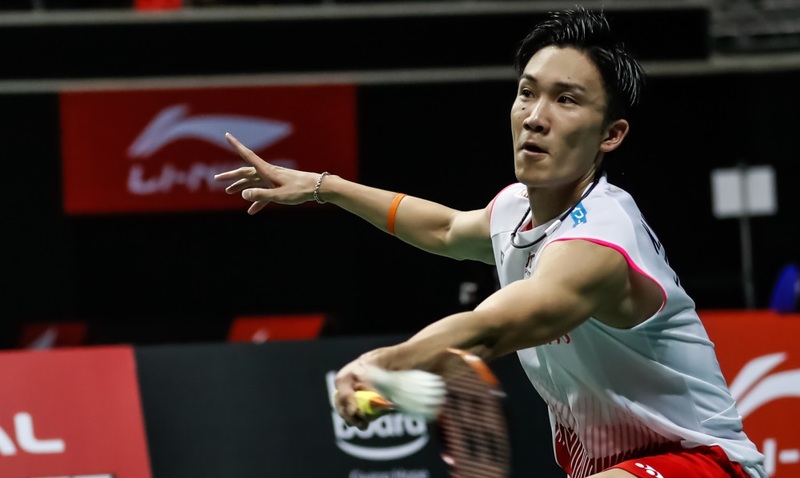 Kento Momota’s masterclass stopped Viktor Axelsen in his tracks after the Dane seemed home and dry in the second game at 16-6. It was Axelsen’s 12th defeat to Momota in 13 matches. Momota adopted a more urgent style today, compared to the recent past where he had chosen a safer approach. Axelsen rebounded in the second though, with Momota’s lifts to his forehand inviting big smashes on either flank that went unanswered. Kento Momota turned it around in the second game against Axelsen. From 6-16 down, however Momota staged a stirring comeback with alert patrolling of the net, keeping the shuttle tight at the tape and cramping Axelsen. Shifting his clears to the deep backhand from where he could better anticipate Axelsen’s smashes, Momota breezily took 15 of the last 17 points to deny Axelsen once again: 21-15 21-18. “I played at a face pace in the first game,” said Momota. “Viktor was always smashing and I could not return well. Viktor won a lot of points with his smashes and he was probably thinking that it would go into a third game. I caught him with one clear and that point changed the momentum of the match. I’m not really satisfied with how I played, though. 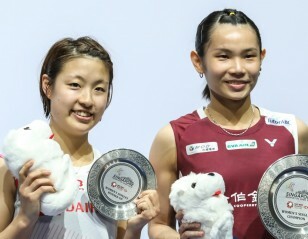 Young Korean women’s doubles pair Kong Hee Yong/Kim Hye Jeong reached their first major final, beating world junior champions Liu Xuanxuan/Xia Yuting 21-15 21-15. Pusarla V Sindhu capitulated 21-7 21-11 to familiar rival Nozomi Okuhara, falling to her worst defeat of the seven she has suffered in their 14 matches overall. In men’s doubles, top seeds Marcus Fernaldi Gideon/Kevin Sanjaya Sukamuljo went down to third seeds Takeshi Kamura/Keigo Sonoda 13-21 21-10 21-19. The Japanese play defending champions Mohammad Ahsan/Hendra Setiawan win the final.